Whether you are a first-time home buyer, looking to refinance your home, or even thinking about investing in a second property, there are a multitude of terms that you may come across. These terms are everywhere- in legal documents, on websites, and on signs. 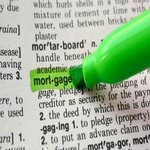 To make sense of all these terms, we have created a dictionary of mortgage terms just for you. We want you to be an informed consumer when making important financial decisions regarding your home. A mortgage with an interest rate which is linked to the economic index. It changes over the mortgage loan term depending on the economic conditions. The economic index is determined by a specified market rate such as the yields on 6 months or 1 year US Treasury Bills; or the cost of funds index as calculated by the 11th District of the Federal Home Loan Bank Board. Learn more about adjustable rate mortgages. The gradual repayment of a liability over an agreed period of time. For mortgage loans, the principal is fully amortized or repaid throughout the mortgage loan term. The average monthly earnings of private sector employees in the US. In conducting the survey, the Bureau of Labor Statistics (BLS) takes into account the earnings of non-supervisory and hourly plant workers. AHE, unlike Employment Cost Index (ECI), excludes all of the salaried workers and is available every month with a small lag. The AHE for the previous month is released on the first Friday of the new month. It is heavily considered by the Federal Reserve when making a decision as to whether to lower or raise the prevailing interest rates. While a percentage point is equivalent to 1, a basis point is equivalent 0.01, or 1/100th, of a percentage point; 1 percentage point is equivalent to 100 basis points. It is used in securities markets to determine the change in the performance of a financial instrument. If the mortgage interest rate increases from 8.46% to 8.51%, then the rates have increased by 5 basis points. A refinancing transaction of a mortgage where the new mortgage principal amount exceeds the existing mortgage loan amount by no less than 5%. Basically, the homeowner takes equity from the home. Freddie Mac estimates that more than 4 of every 5 mortgages refinanced between January and September of the year 2000 were actually cash-out refinances. A mortgage loan which is less than or equal to the maximum allowed loan amount set by Freddie Mac and Fannie Mae. The current limit stands at $417,000 for the continental US; however, the limit for Alaska and Hawaii is slightly higher. It not only meets the funding criteria set by Fannie Mae and Freddie Mac, but it also meets the requirements outlined by the Office of Federal Housing Enterprise Oversight. A temporary home-building loan that usually lasts a period of six months to about one year. It is paid off with a long-term mortgage on the completed home. A statistical measure that indicates how pessimistic or optimistic consumers are about the economy. This measure is determined by the Conference Board at the end of every month. A measure of the weighted aggregate prices of a basket of specified consumer goods and services including food, transport and healthcare. CPI is determined by averaging the price changes of individual items in a predetermined basket of goods and services. The weight given to each basket item is relative to the importance of each individual good and service. This figure indicates the average price changes paid by the urban population of the United States—representing about 80% of the total population. Even though CPI is used to measure prices associated in determining the cost of living, it is not a measure of the cost of living in itself. The CPI for the previous month is published by the Bureau of Labor Statistics during the middle of the new month. A type of mortgage loan which is not guaranteed by the government through VA or FHA programs. Its underlying terms and conditions comply with the funding criteria laid down by Freddie Mac and Fannie Mae. An assessment indicating a person’s history of borrowing and repayment. A number which indicates an individual’s credit risk and is determined from the results of a credit report. The payrolls of nonfarm employees in more than 500 public and private industries. The Bureau of Labor Statistics issues the payroll on the first Friday of each month. The payroll is one of the most critical economic indicators closely monitored in financial markets. A quarterly measure used to determine the growth of employees’ compensation in terms of wages and other benefits. Released by the Department of Labor during the last month of every quarter just about 7 weeks after the completion of the survey, it is based on samples of employer payrolls. ECI takes into account the nature of wages paid, the cost of labor, bonuses accruing to all employees in a company and any fringe benefits. Unlike Average Hourly Earning (AHE), ECI uses fixed employment weights and includes salaried workers; this causes ECI to be much more accurate since it looks at similar sets of jobs. It is conducted on the 12th day of every March, June, September and December. The economic indicator of the prices and number of single-family houses, co-op and condo sales in a period of one month. It is heavily influenced by the mortgage rates that prevailed one to two months earlier. Any new homes sold are counted only when the purchase contract has been sealed. The EHS figure is an annual rate which is seasonally adjusted. The National Association of Realtors releases EHS data on the 25th (or subsequent business day) of every month for details of the previous month. Commonly referred to as the fed funds rate. It is the rate of interest at which any banking institution can lend available funds immediately to another institution overnight. Balances held with the Federal Reserve play a crucial role in determining the prevailing interest rate. The aim of these loans is to enable banks to meet their daily reserve requirements and cash flows. If the rate rises, banks have a greater incentive to retain more of their cash on hand; thus the money available to businesses and households for lending reduces significantly. The Federal Reserve does not set these rates itself because they are determined by market forces on funds through supply and demand. However, it sets a particular target rate and then affects the supply of funds through its activity in the purchase and sale of its own securities. One part of the Federal Reserve Board that sets and determines the US monetary policy. The FOMC Meeting has 12 members who meet eight times annually: the President of the New York Federal Reserve Bank, seven governors of the Federal Reserve System and four other presidents of the eleven regional financial institutions. A mortgage with a fixed interest rate throughout a loan’s term. The monetary value of all final goods and services produced within the US over a specified time period, though usually on an annual basis. It is prepared by the Bureau of Economic Analysis (BEA) at the end of the first month immediately following the end of a quarter; the BEA prepares the report and continues to revise it every 2 months. GDP figures before adjustment for inflation are referred to as nominal GDP. However, real GDP or GDP adjusted for inflation is often quoted the most. This figure includes both private and public consumption, investments, government expenditure and exports minus imports flowing into the US. The ownership value created in a home which represents the reigning house market value less any mortgage amounts owed. A home loan which enables you to borrow money against your home on an as-needed basis. A home loan which is secured by a second mortgage. Home loan used to make physical modifications to home owner’s property. A loan provided by a mortgagor, bank or any other supporting financial institution to enable individuals and companies to purchase a residential home. The number of households who live in their own homes in a country divided by the overall number of households. Therefore, it is the percentage of homes that are actually occupied by the owner. In the year 2009, the home ownership rate in the US was 67.4%. Compared to 1960, more than 50 years ago, this rate has increased by 5.6%. Home ownership rates are released at the end of every quarter by the US Census Bureau. A survey also indicates that US citizens who have their own homes seem to retain more incomes than those who live in rentals. A measure of the price volatility in single-family houses in the United States. The House Price Index, HPI, is a great tool used to estimate changes in mortgage default rates, house affordability and prepayments. These rates are provided by Freddie Mac and Fannie Mae. HPI is a repeat index which focuses on the same property from one release to the other. It should not be confused with the Conventional Mortgage Home Price Index which is published by Freddie Mac. HPI is categorized for the whole nation, by the nine Census regions, the 50 States as well as the 329 Metropolitan Statistical Areas (MSAs). Published on the first working day of every March, June, September and December, HPI is prepared and published by the Office of Federal Housing Enterprise Oversight (OFHEO) and the Federal Housing Finance Agency (FHFA). As the name suggests, it is the number of new residential home projects which have commenced in a month. Also known as the New Residential Construction Report, housing starts is used to indicate the strength and prospects of economic growth and maturity. The month’s report on housing starts is released during the middle of the following month by the Commerce Department. This figure, an annual rate, is seasonally adjusted. The data used to determine housing starts is collected from all home builders and building permits submitted. The amount of money charged by a lender to a borrower for using the lender’s assets, expressed as a percentage. A loan amount which exceeds the limits set by Fannie Mae and Freddie Mae or the Office of Federal Housing Enterprise Oversight (OFHEO). Currently, the minimum amount set for the continental US is $417,001. However, this amount is slightly higher in Hawaii and Alaska. Jumbo loans usually carry higher interest rates, estimated around 0.25% more. Since this loan amount exceeds the set limit, the house is not eligible for securitization or purchase from Freddie Mac and Fannie Mae. This limit is set annually. Determined by dividing the total mortgage amount by the appraised value of the property. It is an assessment ratio of the lending risk which financial institutions and other lenders carefully examine just before approving or denying a mortgage. An assessment with a higher LTV ratio is generally considered risky. So, if such a mortgage is accepted, then the loan will cost the borrower a lot more to borrow. Otherwise, the borrower may need mortgage insurance. If an LTV is 60%, this actually means that the mortgage loan provided is 60% of the property in question. The borrower, in such instances, requires a down payment of 20%. The average price of single-family home sales for both new and existing homes. The mean home price is normally higher in value in comparison to the median price because there are many homes which are highly priced. The mean home price is an economic indicator and a pointer to the level of affordability and availability of mortgages in US. Mean home price values for the current month are released by the National Association of REALTORS® on the 25th of the new month. The Bureau of Census releases corresponding figures a few days afterwards. These figures also indicate lagging since there is a tendency to react to given changes in the interest rates of mortgages. Existing home sales have a tendency to rise when mortgage rates decline. Conversely, they rise when mortgage rates rise. The middle price of all the houses sold with half of the prices valued lower and the other half of prices valued higher. For instance, if the sales of 25 houses are arranged from the least to the highest, the 13th sales value is the median. The median home price is usually preferred because it is not affected by a few prices which are too low or too high. The median home price of new or existing homes sold for the current month is released by the National Association of REALTORS® on the 25th day of the new month. The US Census Bureau confirms these rates a few days later on. A debt instrument which is secured by the collateral of some specified real property. The borrower is obliged by the terms to pay back the debt in a predetermined number and pattern of payments. A measure of the number of applications made to facilitate the purchase of a home. To determine the Mortgage Application Index for purchases, a survey covering at least 40% retail residential mortgage transactions is carried out, and the report for the week ending Friday is released on the following Wednesday. The report is published by the Mortgage Bankers Association of America on a weekly basis. A measure of the number of applications made to facilitate the refinance of a home. To determine the Mortgage Application Index for refinances, a survey covering at least 40% retail residential mortgage transactions is carried out and the report the week ending Friday released on the following Wednesday. The report is published by the Mortgage Bankers Association of America on a weekly basis. An intermediary that brings together mortgage lenders and mortgage borrowers without using its own funds in originating the mortgage. A form or program which is used to determine the monthly repayments of a mortgage. A loan which is secured by real property through use of a mortgage note. The calculation of an assumed amount that will be paid by a potential borrower at a given interest rate. The interest rate charged on a mortgage loan. The act of swapping an old loan for a new one with better terms. A measure of all sales of all newly built homes. This includes the price and quantity of homes sold. It is a lagging indicator of the demand for real property in the market which affects mortgage rates. The new home sales report is released by the Census Bureau of the US Commerce Department. Since it is based on sales contracts, it is generally agreed that it is an accurate indicator of any changes in the economic environment. The reported new home sales figure is seasonally adjusted. A measure of changes in the selling prices of output from domestic producers over time. PPI includes all of the goods and services produced in the US. PPI measures the change in prices from a seller’s perspective. It is commonly quoted to indicate changes in prices of finished goods. However, these goods exclude energy and food. PPI differs from CPI because CPI includes sales taxes, distribution costs and the types of goods and services in question. The PPI for a given month is released by the Bureau of Labor Statistics in the middle of the new month. A measure of output per unit of input. The inputs include capital and labor while the output is expressed in GDP, revenue received and inventories. Growth in productivity means that wages have risen over time while prices remain stable. Productivity is measured across the whole economy or by industry. This enables the government to establish trends in wage levels, technological advancement and labor growth. However, it is difficult to measure productivity in service industries because output is difficult to estimate. Productivity figures are released eight times per year by the Bureau of Labor and Statistics. Acquisition of a new loan to clear an existing loan. A subordinate mortgage effectively uses the first mortgage as collateral while the first one is still active. The combination of several individual mortgages to form a single mortgage-backed security. Individual investors who buy securities from the mortgage-backed security then receive the principal amount and interest payments in proportion to the share of mortgage payments made by homeowners on their loans. Mortgage securitization is approved by both public and private agencies. These include Freddie Mae, Ginnie Mae and Freddie Mac. The process of determining whether the mortgage borrower’s default risk is acceptable. Normally, the lender looks at the borrower’s credit score, collateral and capacity to repay the stated amount at the end of the proposed length of time. This process is done using a complex analysis with the aid of mathematical models. Many borrowers opt to hire the services of a mortgage broker to help them negotiate on their behalf. The success rate of passing the underwriting stage is higher once you’ve received the advice of a mortgage broker. Other than the capacity to repay, the mortgage lender also looks at the borrower’s willingness to abide by the terms and conditions of the loan. The total labor force which is unemployed expressed as a percentage. This section of the labor force must be actively seeking for employment and is willing and able to work. Those who are qualified but are not actively seeking for jobs cannot be termed as unemployed. The unemployment rate is an important indicator of the economy’s growth and the ability to create jobs. The unemployment rate for the current month is released on the first Friday of the following month by the Bureau of Labor Statistics.